I know. I was just blathering away about summer and the heat, and now look. I’ve gone and cranked my oven up for a couple of hours (!!) and made, what is known in the rest of the world as, a winter dish. Something cooked and enjoyed when it is cold out and you need some extra warmth indoors and something hearty to stick to your ribs…not something you make when the sun is blazing like mad and you feel like a roast yourself. As fate would have it however, I live on an archipelago with no winter, and as such have never been trained in the art of “winter eating” vs “summer eating” (nor in “spring eating” or in the much longed for “autumn eating”). No. It was just plain “eating” for me. Anything at anytime. And though it could be argued that I might have waited for our much milder months at the end of the year, I can be illogical at times when my appetites are involved. But aside from those minor personality flaws, there was another reason that brought this beef stew into being. Our local wagyu man. The charming fellow from whom I’ve been buying locally raised wagyu beef (read more here for more information). Since it is more affordable than imported wagyu, we are able to enjoy pretty great steaks (though of course not as awesome as real Kobe beef) without upsetting our budget too much. We usually get the chuck tender steak cut (from the shoulder) – it is cheaper than the more popular rib eye, but because of the wagyu’s signature marbling, still tender, fatty (in a very good way! ), and delicious (if you don’t overcook it! We like our steaks medium rare). The last time we were at the market, charming wagyu man told us that he had some chuck tender in cubes, which some customers requested for soups or stews. It took us all of two seconds to snap them up. – Heat a few lugs of olive oil in a heavy based pot (oven-proof with lid) or Dutch oven. Add in onions, garlic, and carrots and sauté until onions soften. – While the onions/garlic/carrots are cooking, toss your beef with the flour, 1/4 teaspoon pimenton, ½ teaspoon salt, and freshly cracked black pepper. – Add floured beef to the pan, pushing onions/garlic/carrots to one side. Brown beef on all sides. By now there should be some yummy brown bits on the bottom of your pan – deglaze with a few glugs of your wine, scraping those bits up. – Add the tomatoes, 1/2 teaspoon of pimenton, and the farcelettes and stir. Add enough red wine to come up almost to the top of the meat but not covering it. Add freshly cracked black pepper, a dash of cayenne (the amount will depend on your heat tolerance) and stir once more to get everything mixed. Bring to a boil. You can bash up some of the tomatoes with the back of your spoon. – Once it boils take the stew off the stove top, cover with lid, and stick in a 170C oven for 1 hour. – After 1 hour, remove pot from oven and add potatoes and olives. Give this a stir, cover, and return to the oven for another hour, or until meat is tender. Taste and adjust seasoning as needed (you may need to add more salt). – The sauce should be rich and thick and coating the meat. If it isn’t, just cook it further on the stove top again until it reaches a consistency you like. It goes without saying; only use a wine that you would also drink. If you don’t like the way it tastes in the glass then it won’t do your dish any favors either. Then drink the rest of your bottle with your meal…or while cooking it, I won’t tell 😉 As with all stews and braises, be patient and you will be rewarded. These dishes cannot be rushed. If the meat isn’t tender after two hours, then just give it a gentle stir, cover, and return the pot to the oven until it is. If you don’t have farcelettes, any bouquet garni will do. SOME NEWS: 80 Breakfasts is mentioned in the Femalenetwork.com Blogs We Love! The Femalenetwork.com is a website under the esteemed Summit Media publishing group…a huge local publishing house that is responsible for titles like Town & Country, Martha Stewart Weddings, Cosmopolitan, Good Housekeeping, and Yummy magazine just to name a few. I’m thrilled to be mentioned! Hi Jo! If beef stew were always that good, I'd eat it as well in any weather! Not your typical beef stew it seems – does it have a Spanish influence? It sort of reminds me of kaldereta? Maybe it's the olives – a wonderful touch. And congratulations on your feature! Well done on the feature! After living in Thailand I can understand eating a 'warm' dish in the heat. This sounds great and being in a hot spot right now I actually totally crave it! You're not alone. In this household, people would eat anything that is set on the dining table whether it's a winter dish or not, for as long as they are good. And sometimes they even come in a hotpot. Your beef stew sounds fantastic most especially with the beef wagyu. I better find him. 🙂 Congratulations on your feature. You really deserve it. That looks mighty delicious and I consider us very fortunate to not feel the need to conform to any season when preparing food. It will never be truly cold enough for full-on chicken soup weather, so why deny ourselves the pleasure, right? Trissa hit the nail on the head (and yes, I love a good caldereta), though I think a smidge of liver forcemeat in caldereta is what gives it its unique character. I'm not fortunate enough to have ever tasted Wagyu beef, but someday, hopefully. I am a complete baby about the heat and go to great lengths to avoid turning on my oven during summer. That being said, I am happy it is still cool here because this recipe looks amazing and I am definitely making it tonight. Hi Trissa! I guess it does have a bit of a Spanish influence…since I like Spanish flavours I think they have a tendency to sneak into my cooking a lot 🙂 I do like kaldereta so maybe I was also subconsciously channelling that! Hi Divina! I think it’s really a phenomena in countries that don’t have four seasons! The Wagyu guy is in Salcedo Market 🙂 Thank you! Hi Midge! Great minds think alike! Hi Manggy! So true! That’s what I say – why deny the pleasure when we don’t have a winter (or an autumn) anyway 🙂 The one I buy in Salcedo market is the meat of locally raised wagyu breed cattle – so the meat itself isn’t imported, making it more affordable 🙂 I love caldereta too! Hi Erin! Thanks! It’s hot all year in my kitchen…so it doesn’t matter when I cook these dishes! 🙂 Hope you like it! This is similar to a stew my mom used to make.I'm definitely making this. Thanks for posting this recipe. Looking forward to trying it myself. mmm! I have craving for winter food even when summer heat is on, too. It's normal I say. 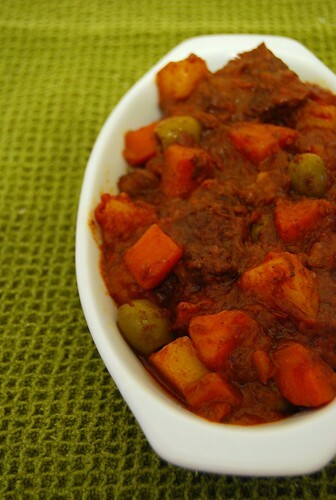 Your beef stew looks and sound fabulous! Joey – it was 31 deg C here in S'pore at 8pm, and hubby and I were devouring steaming bowls of a thick minestrone – and sweating buckets. Go figure! Ohh, I'm craving beef right now so this did not make it a lot better :p Looks like something that can keep me warm on my trip back to Sweden. Hi Anonymous! Hope you like it! Hi Zlamushka! Wish I could send you some of the warmth from here…and some of this beef stew as well! Hi Anh! Yes, I think it’s normal too 🙂 Thanks! Hi Linn! I can certainly keep you warm that’s for sure! Have a safe trip! Congrats for the Blogs We Love mention!! I'm still suffering from the winter cold. I wish to stay in a place like yours. Maybe I should move to your place 🙂 I have to keep cooking warming food. Love your beef stew. Looks delicious and warming. Hi Veron! Thanks! Yup adobo is some kind of a stew…and if we waited for cold weather before eating stews and soups we wouldn’t be eating them ever! This is fantastic! I like experimenting a lot with food, and I have to say, winter or no winter, pop open a nice bottle of white wine and your good to go with this fab dish! good job! Well, why not eat stew in the summer right? What are you to do if you never even have winter? This looks gorgeous really.. Thanks Junglefrog! Since I have no winter I have no recourse…or so I like to claim 😉 I can always wait for our "cooler" (relatively) months at the end of the year, but really I can't! Who says you can't have stew in the warm months. Go ahead. It looks great! Hi Katiez! Her stories are amazing…and quite entertaining 🙂 Hope you can find some sumac! Hi Erin! So happy to hear you enjoyed it! that looks really delicious, joey! i love hearty stews,it's one of my comfort foods — be it a rainy afternoon or a lazy summer evening. Maybe I’ll try to cook beef stew to eat with bread. Haha. Thanks for sharing about this dish.